thredUP is an online second hand clothing store that focuses on fashion styles and brands. Users can buy items and sell their own using an easy to use interface. The privately held company is headquartered in San Francisco, California, United States, with co-founder James Reinhart serving as CEO. Netflix CEO Reed Hastings and former eBay CEO, Brian Swette, also serve as advisers. 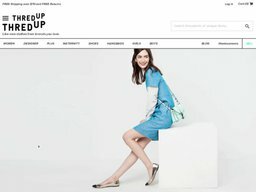 Despite catering to all demographics early on, thredUP now currently focuses only on women's and children's clothing, as the men's category was not very active. The site is located at thredUP.com. If you want money off your order you can redeem special thredUP coupons, which we collect here at Coupofy. We always keep these up to date so be sure to check back whenever you plan to order. thredUP was founded in Cambridge, Massachusetts in 2009, by James Reinhart, Chris Homer, and Oliver Lubin. In the beginning they tested a concept of "swapping" used clothing, focussing on men's dress shirts, but by 2010 they decided to drop men's clothing altogether and relocated to San Francisco. Over the years they have secured more than $50 million in funding from various investors, including Trinity Ventures, Redpoint Ventures and others. Today thredUP works like a retail outlet and does not do direct swapping of items. thredUP's clothing covers Women, Kids & Baby, Shoes, and Handbags. The inventory is changing every day but mainly falls under: Dresses, Tops, Denim, Bottoms, Sweaters, Outerwear, Maternity Clothing, and Workwear. Shoe styles include Sandals, Wedges, Heels + Pumps, Flats, Sneakers, and Boots, while bag styles include Shoulder Bags, Totes, Cross Body, Satchels, Hobos, Clutches, Wristlets, and Wallets. All sorts of popular brands are available, and you can search via keyword, size, style, color, condition, and price range. For buyers thredUP functions like a traditional ecommerce site with a simple basket and checkout system. Product pages clearly describe the nature of the second hand clothing (any flaws, fading or damage) and real photos are used so you can see what items look like. You can also shop on the go using the Android and iPhone app. Currently the site is only open to US customers and before you can gain access to the inventory you must enter your zip code and register an email address. You can also checkout using Paypal. When redeeming a thredUP coupon code, simply copy it from here at Coupofy and paste it in to the promo box during checkout. If applied correctly you should see your total order value drop. Orders over $70 ship for free, and under this threshold it's a flat fee of $5.99. Occasionally you can also use thredUP coupons to get free shipping regardless of the order value. The website offers a 30 day returns policy from the purchase date. These are accepted no questions asked so long as the items are in the same condition as they were before you received them. A prepaid return label can be printed from your account and you will not be charged for this if you accept a refund in the form of store credit. If you have used a thredUP promo code for a discount, you will obviously only be refunded the amount charged to your card.